Sixteen new technicians were awarded certificates in major appliance repair and service on Tuesday evening in a small ceremony for family and friends at Bermuda College. The graduates included Jennell Ingham, Benjamin Bothelho, Teiko Furbert, Bambi Pimental, Chris Brito, Kim Wade, Dwight Trott, Troy Furbert, Gerald Young, Gary Blackwell, Micah Smith, Kyle Fraser, Romario Dill, Terry Greene, Shrundae Thompson and Gary Woolridge. The 18-month programme, which was piloted through the Division of Professional and Career Education [PACE], was overwhelmed with subscribers at its first information session. Organisers, in attempts to gauge interest in the new offering, catered for 25; 80 persons turned up, according to programme lecturer and HVAC instructor at the College, Cannoth Roberts. “We needed appliances for our students to work on in the HVAC and air conditioning courses,” recalls Mr. Roberts, “and went begging to Bermuda Gas & Utility to ask for old appliances. Out of the 80 that showed up at the initial information session, 32 signed up – but the programme was designed for 15. Through attrition, sixteen ended up staying the course. “The majority of those that stayed just wanted a second chance to re-invent themselves, or enhance their skill set. I’m pleased to say that one hundred percent of our graduates are now employed in the field,” he said. “Ironically, one of the biggest critics of the pilot programme, ended up becoming one of its biggest fans. Joshua Bates, founder and CEO of Joshua Bates Trading, Ltd., speaking at the award ceremony Tuesday evening acknowledged he thought the programme was set for failure,” the College said. “I’m honoured to be here. I remember 25 years ago when the appliance business was part of Bermuda’s captive retail sector,” Mr. Bates said. “Now, the technical side has made it become a tough industry. Everyone in the retail side of the business used to use independent technicians when appliances broke down, but that became more and more challenging. David Adderley of Bermuda Gas & Utility said the Company got on board with the College in time to help launch the programme. “The demand for reliable technicians is desperately needed,” he told the graduates. “If you can be reliable, you’ve won half the battle. Be there when you say you will be there. Kim Wade, spoke as the student representative for the group, saying: “When I first heard about this programme, I wasn’t sure whether I should apply or not. But the programme has been a god-send to me. Official ceremonies for PACE graduates will take place in December 2016. 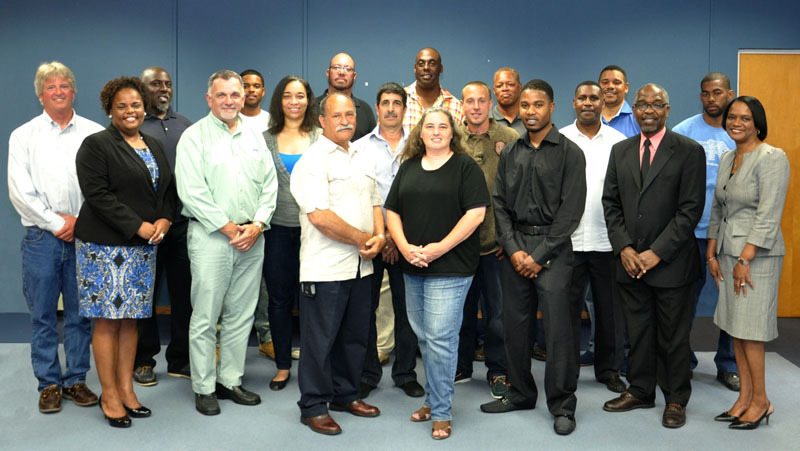 Congratulations to all who participated and earned their Certificates in their respective fields – Bermuda does need more of these tradesmen and women. I work in a local company that employs Bermudians, and we teach them our trade. It is good to see the Bermuda College putting on programs like this. I hope they continue and possibly add more fields to their program – a course in glass/mirror cutting and installations would be a good one to think about adding. Again, congratulations. One question, where are they going to work? All 16 graduates have found employment! Read the article – Lol: “I’m pleased to say that one hundred percent of our graduates are now employed in the field,” he said. – 9th paragraph. . . It is also great to see the “old man” among the graduates….see I didn’t call any names right Terry Greene! I am very sure that I can speak on behalf of all Bermudians in wishing the graduation class a great future in this much needed field of expertise. Congratulation to all graduates for their certification.